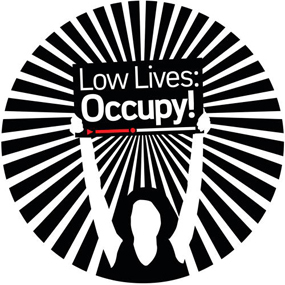 The Low Lives: Occupy! program will include thirty-five performance artists, Occupy groups, and artist collectives located worldwide in solidarity with Occupy Wall Street and the Occupy movement for the 99%. Participants will expand the reach and visibility of the Occupy protests by broadcasting to an international audience community. Thirteen co-presenting organizations in eight countries including U.S., México, Spain, Colombia, Brazil, Northern Ireland, France, and Argentina, will project Low Lives: Occupy! in their own venues and public spaces. The Occupy protests, and the myriad of perspectives and experiences related to this unique movement, will be amplified, explored, and experimented with, through Low Lives’ internet-based creative platform. The Hemispheric Institute, presenting partner and official New York City venue for Low Lives: Occupy! will present one live performance during the March 3 event, and screen all other selections in real time using live-streaming technology. Presenting partner and event organizer, Occupy with Art, will host the live simulcast at OccupywithArt.com, providing the means for viewers around the world to access the program online. Co-presenting partners of Low Lives: Occupy! will present the simulcast in their venues and public spaces. Founded in 2009, Low Lives is an international platform for live performance-based works transmitted via the internet and projected in real time through online broadcasting networks. These networks provide a new alternative and efficient medium for presenting, viewing, and archiving performances. Low Lives celebrates the transmission of ideas beyond geographical, political, and cultural borders, and opens multicultural and intergenerational dialogue through visual language, new technologies, and contemporary expressions.